In its early days the Bearded Collie worked primarily as a cattle drover, although they also were used with sheep. Today they are primarily kept as companions. 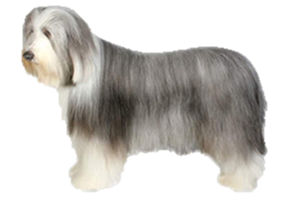 The first can be discounted, as the Bearded Collie is much older than the Old English Sheepdog and is in fact likely its ancestor. The answer is probably a blending of the remaining theories. In 1514 a Polish merchant traded a shipment of grain for sheep in Scotland, bringing six Polish Lowland Sheepdogs (whose ancestor is thought to be the Komondor) with him. These dogs were then bred with local Scottish dogs (quite possibly the Collie) and the result of this cross could have led to both the Old Welsh Grey and the Bearded Collie, with either appearing first. However it came to be, the Bearded Collie has been known in Scotland since the 1500s. It slowly fell out of favor until by the end of WWII it was nearly extinct. The breed was saved by Olive Willison, who had asked a Scottish farmer to supply her with a Shetland Sheepdog, some mishap occurred and the pup she received was in fact a Bearded Collie. This pup, along with a dog she obtained later became the basis for the breed we know today. Is the Bearded Collie Right for You?